Many a fine old rifle languishes in deep storage or is on display as a “wall-hanger” simply because nobody chambers a new rifle in the same cartridge, and the vintage ammunition is difficult if not impossible to find. Some of these guns are prized as collector items, but more would be “shooters” if only the right ammo could be found. Many a hunter might want to carry on a family tradition by bringing home the venison with Granddad’s rifle. Well, with a little effort, maybe he can. Check with Midway and some of the other big catalogers for ammo you can’t find on the shelf. Winchester and Remington both produce annual runs of almost-obsolete cartridges. Most of these limited runs sell out quickly, so place back orders when you can, to get in line. Also check the smaller ammo companies, as many specialize in hard-to-find cartridges and produce them year-round, some with modern newer bullets that significantly upgrade performance. A flip through the latest Midway catalog turned up 38 companies selling rifle ammunition. When Winchester or Remington make but one cartridge for an obscure rifle, it most often is loaded with their standard bullet. Winchester loads .264 Winchester Magnum with a basic Power-Point bullet in one weight only. Look to DoubleTap, however, and you may find .264 cartridges loaded with Nosler Partition bullets. Yes, you will pay a bit more. But if you plan on hunting with this high-velocity magnum, I believe the better bullet is more than worth the added cost. The .35 Remington is a pretty good short-range deer cartridge, with either the 150- or 200-grain loading from Remington. Yet the range can be greatly expanded with a Hornady 200-grain Flex Tip bullet and their LeverEvolution powder technology. The Remington loads deliver 755 and 841 foot-pounds of energy at 200 yards; the Hornady packs 1,317 foot-pounds of punch at the same range. The .35 Whelen is another fine old hunting cartridge, especially for larger big game like elk and moose where a savvy hunter would likely prefer a premium bullet. Remington loads no premium bullets for it. 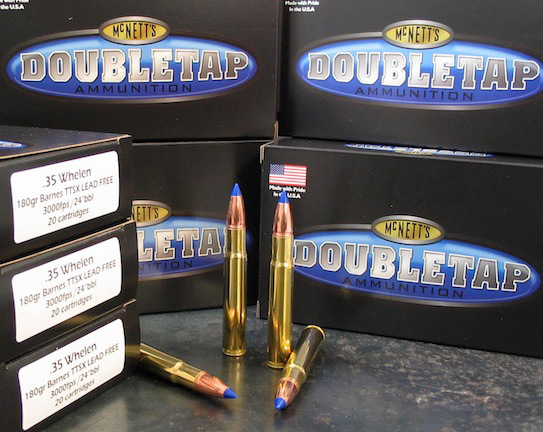 DoubleTap offers five, including the 225-grain Nosler AccuBond and the 200-grain Barnes TSX. In 1978, Winchester thickened the steel at the rear of the action of the Model 94 lever action for a new cartridge with about 10 percent more power, making the .375 Winchester Big Bore Model 94. It hit much harder than a .30-30 with only a small increase in recoil. Yet it didn’t sell as hoped, perhaps because it was offered only in expensive deluxe rifles. In 1982, they chambered the Big Bore for two more cartridges, the .307 and .356 Winchester, rimmed versions of the .308 and .358 Winchester cartridges. Marlin’s lever action already was strong enough to chamber all three of the new cartridges, which they did. Between Marlin and Winchester, quite a few rifles were sold, and Winchester still makes annual runs of all three cartridges. The .356 costs $53 a box, and it sells out quickly. I wonder how many fine old lever-action .307 and .356 rifles would come out of the closet if Hornady loaded for them with high-performance MonoFlex and FTX bullets and LeverEvolution powder technology? The boost in performance would be dynamic. Hornady has become a major ammunition manufacturer due in large part to this innovation, and their loads already have breathed new life into such venerable rifles as the .220 Swift, 6mm, .32 Special, 8x57 Mauser, .303 British, .35 Whelen, .358 Winchester and .444 Marlin. Some of the lesser-known specialty ammo companies also have stellar reputations backed by state-of-the art production. Black Hills specializes in accuracy loads, and, as I understand it, they sell far more to the military than to civilians; the military is plenty fussy about their ammo. Other companies to check for premium bullets in popular as well as somewhat obscure cartridges, or maybe just a hunting load you cannot find at the local gun store, include CorBon and Grizzly. While the .32-40 was designed as a target cartridge with minimal power and recoil, it was regularly used as a deer load in Winchester lever actions. 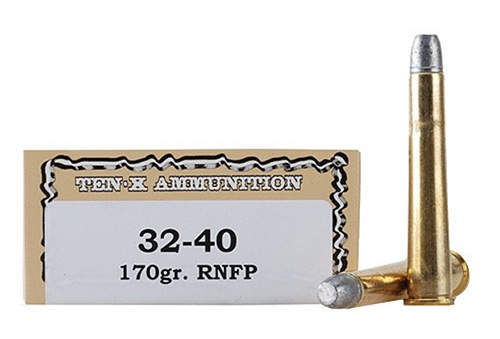 I can’t find anyone today listing a hunting load for this one, but Ten-X loads a round-nose 170-grain lead bullet for the Cowboy Action crowd, at a cost of $43 a box. The muzzle velocity of the Ten-X ammo is 1,700 ft/s, about the same as a .357 Magnum fired from a rifle. Handloading opens up even better options. Let’s take that .32-40 as an example. Hornady offers a 170-grain jacketed flat-point game bullet intended for the slightly faster .32 Special, and it should expand sufficiently at .32-40 speed. Winchester also produces a limited run of .32-40 brass, at a Midway price of $38 for 50 cases. If you already own the handloading press and other gear, you can pick up a set of .32-40 dies for less than the price of one box of loaded ammo, buy some Hornady bullets and Winchester brass, and you’re ready to go. Other obscure cartridges with brass available in limited production include .218 Bee, .222 Remington Magnum, .225 Winchester, .220 Swift, .22 Savage Hi-Power, .256 Win. Mag., .32 Winchester self-loading, .32 Remington, .351 Win. Self-Loading, as well as many of the larger “buffalo” calibers. For truly obscure brass, look not only to Winchester, Remington, Hornady, Norma, Starline and Federal but also to other less-familiar names, such as Bertram and Quality Cartridge. It may be a bit expensive, but you can usually reload a case many times, and handloading data is published for just about every cartridge ever made, including the obscure wildcats. What if brass and bullets simply are not available? Is the rifle a wall-hanger by default? Maybe, maybe not. It may be possible to reform another brass case to the one you want. If bullets aren’t offered, perhaps you can cast your own. Many wildcat cartridges were made by modifying a popular existing case. The .25-35, .219 Zipper and .219 Donaldson Wasp varmint cartridges were all made by reforming .30-30 brass. I doubt that the .358 Winchester will ever become truly obsolete, but if it ever does, one could simply run a .308 Winchester case through a .358 resizing die. Some conversions are a bit more complicated, requiring two or even three steps in three dies, but possible, nonetheless. Redding Reloading has a list of about thirty available conversions, including .219 Zipper and Donaldson Wasp, .22 Savage Hi-Power and .25-35 from .30-30 Winchester; 6.5 Remington Magnum from .338 Winchester; and .356 Winchester from .444 Marlin. Back in the old days, many “new” cartridges were made by simply reshaping .45-70 cases, and all can still be made with .45-70 brass. It would be great to hunt chucks or prairie dogs with a .219 Donaldson Wasp, at one time a popular benchrest and varmint cartridge in highly accurate single-shot rifles. If you handload, you can. The needed .30-30 cases are readily available, inexpensive, and you may reform them to launch 50-grain bullets from a .219 at about 3,700 ft/s, more velocity than the .223 and almost equivalent to the .22-250. Perhaps your antique varmint rifle is an obscure 17 caliber. Most conversion die sets for these begin with .22 Hornet, .218 Bee and .222-style cases. Reloading data for almost all of the older cartridges has been published recently enough to include modern powders, better varmint and target bullets. If you don’t know an old rifle’s true caliber, a gunsmith (or you) can find out with a chamber casting. The casting metal, called Cerrosafe, can be melted in a pan of boiling water. Simply plug the barrel ahead of the chamber with cloth, point the muzzle down, and pour the molten metal in from the breech. It sets up quickly and is then easily pushed out with a ramrod. There is untold history in vintage rifles, some more than a century old yet still perfectly serviceable. Most may be brought back to life with the right ammo. I inherited a couple of “obsolete” rifles from my father, and with the right hunting loads, I carry them just to walk a mile or two in his shoes.